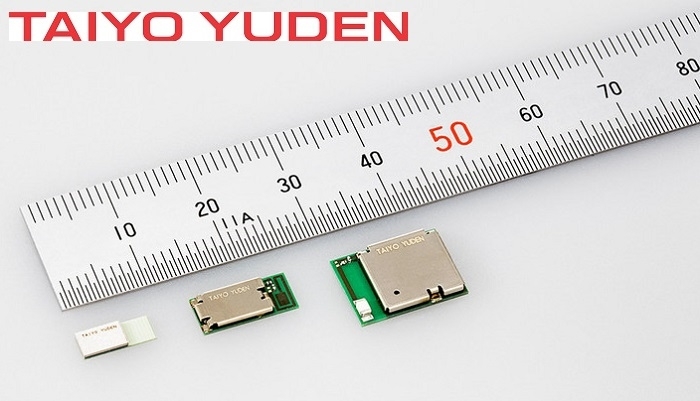 TAIYO YUDEN has introduced three new Bluetooth 5 modules - EYSHCNZWZ (9.6 x 12.9 x 2.0 mm), EYSHJNZWZ (5.1 x 11.3 x 1.3 mm), and EYSHSNZWZ (3.25 x 8.55 x 0.9 mm). These wireless communication modules, compatible with the latest wireless communication standard Bluetooth 5, are ideal for various small, thin devices including wearable devices, healthcare equipment, smartphone peripherals, and IoT-related devices. Most devices that require short-range wireless communication (e.g. wearable devices, healthcare equipment, smartphone peripherals) are compatible with the Bluetooth wireless communication standard. Notably, Bluetooth 5 has drawn public attention due to its communication speed, which is twice as fast as Bluetooth V 4.2. The size of some conventional Bluetooth modules is not suitable for wearable devices that are the size and shape of pens, rings, or glasses; demand for much smaller modules is high. Against this backdrop, TAIYO YUDEN has added the EYSHCNZWZ, EYSHJNZWZ, and EYSHSNZWZ modules compatible with the latest standard Bluetooth 5 to its product lineup. EYSHSNZWZ in particular utilizes its unique shield mold technology to achieve a thickness of 0.9 mm (about one third the volume of EYSHJNZWZ (5.1 x 11.3 x 1.3 mm), the smallest of their conventional modules). According to TAIYO YUDEN, this is the world's smallest Bluetooth module with an integrated antenna. TAIYO YUDEN will commence mass production of these products in August 2017. A sample of each model will cost 3,000 yen. Click here to learn more.